WAILUKU — In a tale of two halves, the Lahainaluna High School football team ended up with the bigger piece of the pie. 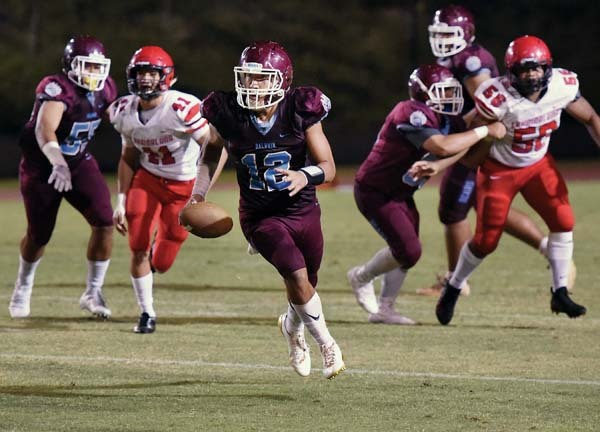 The Lunas beat Baldwin 28-20 on Friday in front of about 4,000 fans at War Memorial Stadium in a battle of the two teams that have dominated the Maui Interscholastic League for the last two decades. 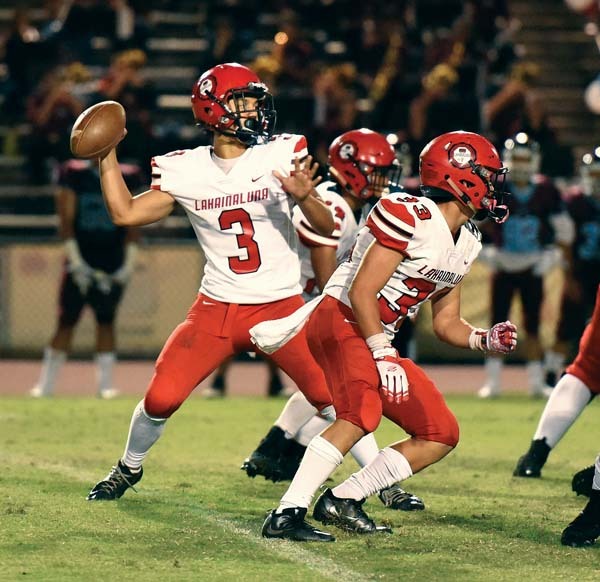 Lahainaluna scored the first 28 points, all in the second quarter, before the Bears rallied with three touchdowns in the second half, the last with 65 seconds to go. Baldwin’s 15-game MIL winning streak was snapped as the Lunas won for the first time in five tries in the series. The start of the game game was delayed 25 minutes because the Lunas’ bus was stopped behind an accident in Olowalu. 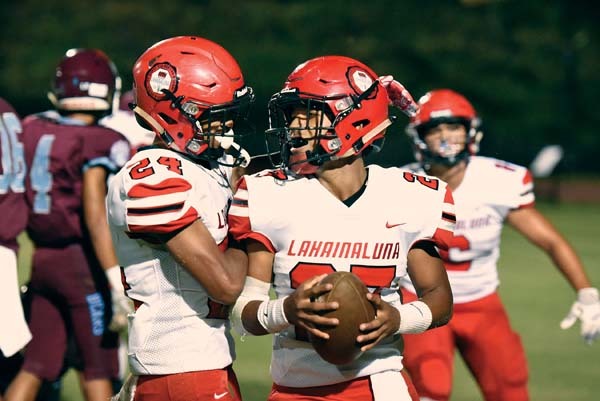 Lahainaluna (3-0) went in front 7-0 on a 24-yard touchdown run by Joshua Tihada with 10:58 left in the second quarter to cap an eight-play, 71-yard drive. Two plays before the touchdown, Elijah Ragudo ran for 14 yards on fourth-and-4. A 10-yard penalty — one of 11 flags thrown on the Bears in the first half, for 90 yards — gave the Lunas a first down on the Baldwin 43-yard line on the drive. The Bears (1-1) totaled 19 penalties for 140 yards, and the Lunas declined two others. Tihada finished with 100 rushing yards on 16 carries, while Ragudo had 93 yards on 11 carries and Etuati Storer had 94 yards on 14 carries. 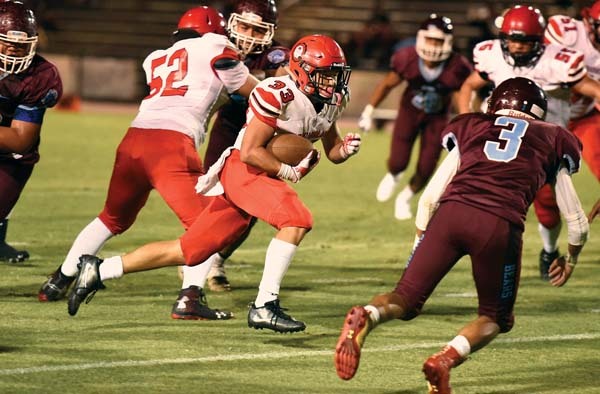 The next time Lahainaluna touched the ball, Storer broke free through the middle for a 69-yard touchdown run after a fake handoff caught the Baldwin defense off-guard. Lahainaluna then doubled its lead in a 49-second span. 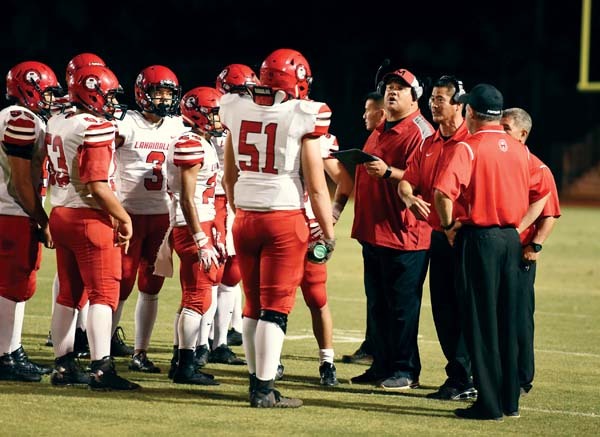 Aliksa Pihda scored on a 5-yard run to culminate a six-play, 63-yard drive that began with a 34-yard pass from Storer to Siale Hafoka, and on the Bears’ first play of the ensuing possession, Hafoka recovered a Bishop Wickes fumble –Ragudo scored on a 16-yard run two plays later. The Lunas stopped the Bears on the Lahainaluna 4-yard line to end the half when Chayce Akaka was tackled inbounds after a scramble. Baldwin started the drive at its own 49 after an interception by Mahi DeFrancia with 31 seconds left in the half. Akaka ran for 16 and 25 yards on the first two plays of the series. Baldwin found the end zone for the first time when Brayden Reys-Sojot caught a 3-yard pass from Akaka with 3:45 to go in the third quarter. The highlight of the 15-play, 80-yard drive was Akaka’s 25-yard strike to Kainalu Lacno to the Lunas’ 2. Frank Galios scored on a 2-yard run for the Bears on their next possession, capping a nine-play, 73-yard drive with 11:01 to play. The Lunas stopped the Bears on their next drive when Siale Hafoka intercepted an Akaka pass at the Lahainaluna 15-yard line with 7:02 to go. Reys-Sojot then caught an 8-yard touchdown pass from Akaka, but Baldwin’s pooch kick went out of bounds and Lahainaluna ran out the clock. LL–Joshua Tihada 24 run (Kaihulali Casco kick), 10:58. LL–Etuati Storer 69 run (Casco kick), 8:24. LL–Aliksa Pihda 5 run (Casco kick), 3:42. LL–Elijah Ragudo 16 run (Casco kick), 2:53. B–Brayden Reys-Sojot 3 pass from Chayce Akaka (Maluhia Plunkett kick), 3:45. B–Frank Galios 2 run (kick failed), 11:01. B–Reys-Sojot 8 pass from Akaka (Plunkett kick), 1:05. Junior varsity–Lahainaluna 28, Baldwin 6.